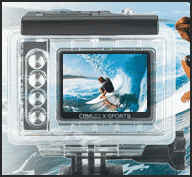 First off the bat, it’s small and light, just the way an action camera should be. It only weighs 3.32oz or 94 grams and measures 73 x 49.5 x 29.5 mm in dimension. Fits in the palm of your hand (almost the same size as the GoPro). The camera has a recording time of about 90 minutes with a native resolution of 1920×1080 and has the ability to zoom up to 10X. The digital zoom is paired with an ultra wide angle lens. 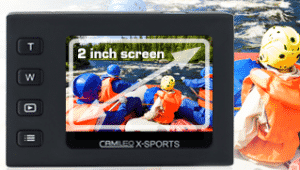 Not only does the camera has a LCD screen size of about 2 inches but also the screen is a liquid crystal display to give out the best quality pictures. 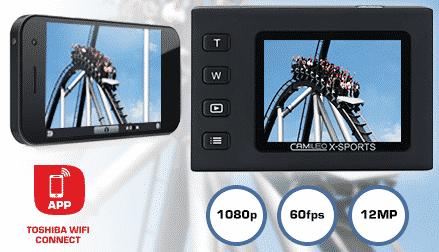 The x-sports shoots maximum of 1080p video at 60 frames per second. Thanks to its 12 megapixel CMOS sensor, this also delivers high definition still snaps. Furthermore, the camera has an auto focus shooting feature and this makes it easy to take snaps and videos. Burst mode enables you shoot multiple shots in timed intervals. Great for sequence shots or to pick out the best shots, as well as taking photos and videos at the same time. The camera also comes with a remote control that can easily be worn on a wrist .The remote control has big easy-to-press buttons. The battery life is rather good too. It will last up to 2 hours when shooting at 30 frames per second or 1.5 hours when shooting at 60 frames per second in high definition. Video HDMI output, a 802.11 internal Wi-Fi b/g/n connection ability and the Wi-Fi encryption like WEP, WPA and WPA2 for secure uploading of photos and videos wirelessly to your PC or tablet. The camera also has a micro USB 2.0 port for charging hence the camera can still be charged even if it’s clipped to the helmet. The camera uses a micro SD memory card support to store your photos and videos. It’s waterproof up to 60M deep with the case. Same specs as the GoPro and Drift HD ghost. It’s shockproof with safe drop testing up to 1.5M high, if it ever falls to the ground. When compared to Gopro Hero, the camera has a few extra advanced features. One is compatibility with android and iOS connections so you can use your smart phone to control and view back images/videos. The dimensions are very similar, but it is slightly lighter than the Gopro. Another advantage off the Toshiba unit is that you get a box full off goodies! In the box comes a full swag of gear. The camera and case of course, plus extras such as a handlebar mount, a board mount, and a waterproof remote control. 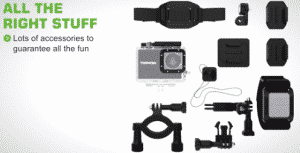 With Gopro’s Hero, these accessories are sold separately. 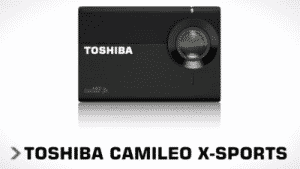 Pros of Toshiba Camelio x-sports camera. Photos and videos taken simultaneously. Too be honest there aren’t really any bad things about this camera. Right now the camera is only available in the UK for around £230 (around US$349). At this point in time, it seems no online vendors are selling it so you’ll have to check out your local camera store in the UK if you want this bad boy. Release dates for the US market is yet to be announced. Overall, after looking over the points of this action camera in this Toshiba Camileo X-Sports review, it is definitely a serious contender that rivals GoPro and Drift. We’ll see how consumers like it when it is released to the domestic market more widely.